The sideline clear is a situation that is commonly taken for granted by either the clearing or the riding team. 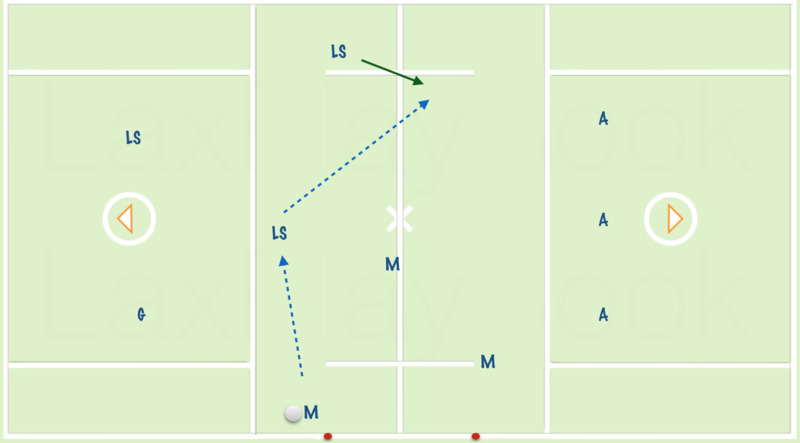 In this scenario, play has stopped and the ball is restarting above the restraining box but behind the midfield line. Very often you will see the team inbounding the ball by giving it to their best midfielder to run over the line. It sounds simple enough, but remember play is starting after a dead ball and the riding team has a chance to set up players exactly where they want to be. What if they set up all of their attackmen in front of the ball carrier? What if they put a quality long pole on him? or what if he simply just can not beat the person in front of him? Typically teams will place their attackmen to double or triple team the middie to box him in and force him out of bounds. Also if you do this, success will be defined as getting it over the line, nothing more. You are not creating a fast break or any other type of scoring opportunity. As the clearing team you can properly set up for this situation and can easily use this as a way to threaten for a quick hitting goal against a lazy ride. Sadly lazy rides are common these days where most teams will concede this situation to be an automatic clear. In that circumstance you can take the easy clear or you can look it as an opportunity for much more.